SCVHistory.com LW3099 | Film-Arts | Barbara Britton & Sonny Tufts with Calf in Owen Wister's 'The Virginian' (Paramount 1946). Barbara Britton and Sonny Tufts, co-stars in the 1946 Joel McCrea vehicle, "The Virginian," pose with a calf. 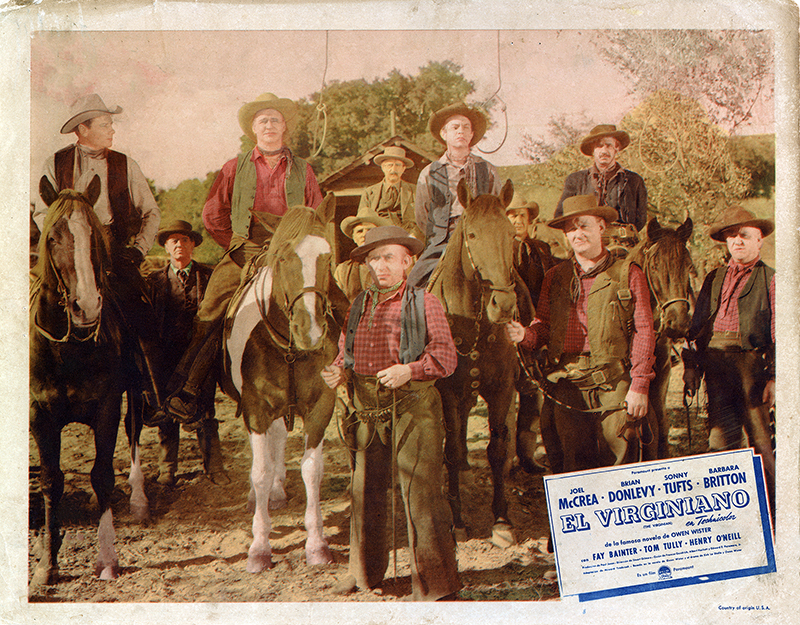 Locally, the Paramount picture was filmed at the Placeritos (Monogram) Ranch and at Andy Jauregui's movie ranch in Placerita Canyon. Jauregui also provided stock for movies (and rodeos) and may have provided this calf. 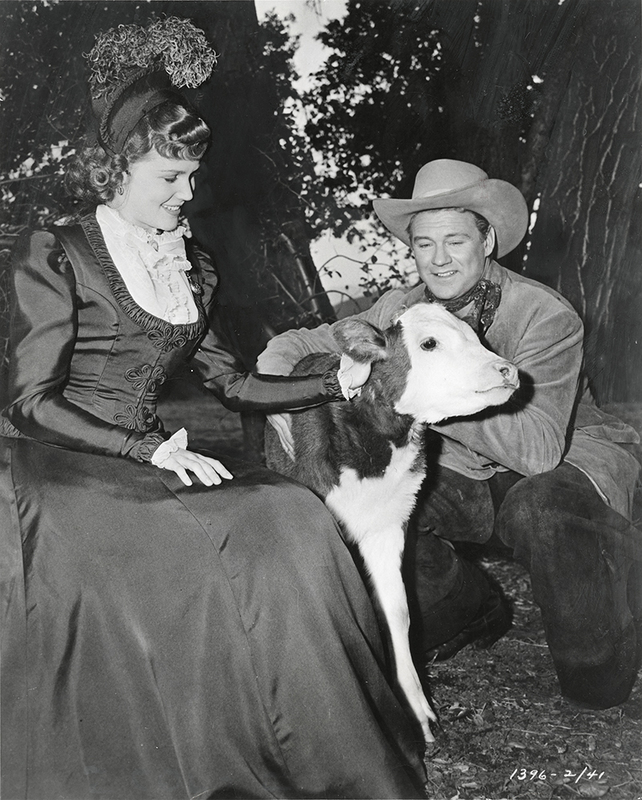 SMART DOGIE — Movie animal trainers are so proficient that even this young calf, admired by Barbara Britton and Sonny Tufts, proved perfectly tame when it performed in scenes for Paramount's Technicolor production, "The Virginian." The production also used the Paramount Ranch in Agoura, Wildwood Regional Park in Thousand Oaks, and a location in Kernville. The rest of the credited cast includes Brian Donlevy, Fay Bainter, Tom Tully, Henry O'Neill, Bill Edwards, William Frawley, Paul Guilfoyle, Marc Lawrence and Vince Barnett. 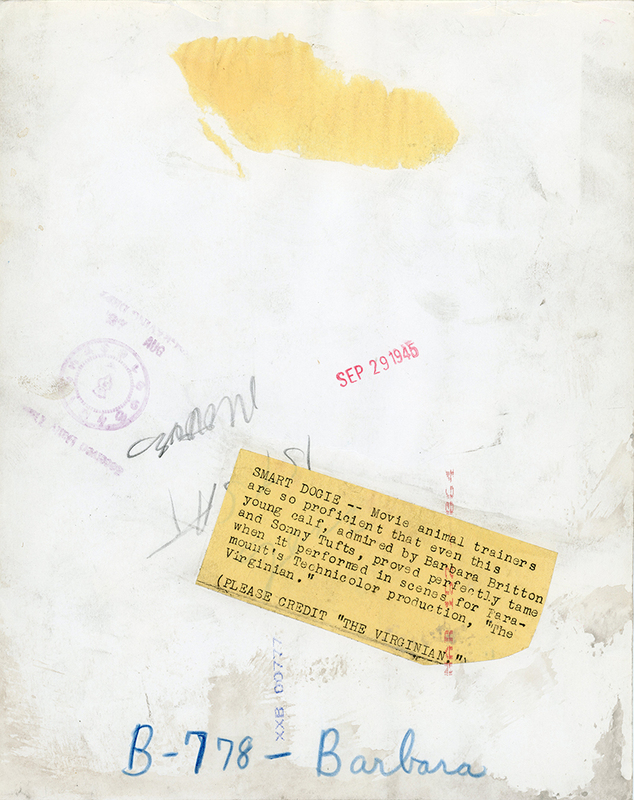 LW3099: 9600 dpi jpeg from original wire photo purchased 2017 by Leon Worden.